Firm Central is a Legal Practice Management solution that provides a holistic workflow by offering fully integrated, user-friendly, secure tools to manage both your law practice and legal business. 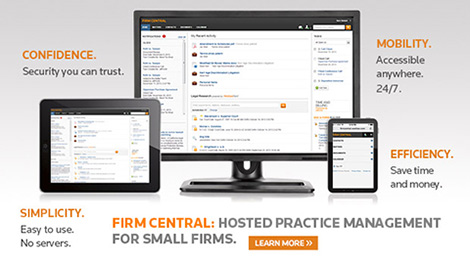 Firm Central is brought to you by the same team behind Westlaw, the leading legal research platform on the market, built by legal professionals, for legal professionals. A holistic approach makes every task more efficient, and every staff member more productive. It’s mobile so you can work from anywhere, while delivering superior client service as a result. Better for your firm, better for you clients. This dashboard organized crucial matter information including contacts, tasks, notes, document, communications & calender events. Use it to track and record billable time and associate applicable fees with your matter for organized, transparent & efficient billing. Calculates and manages court deadlines based on Westlaw legal calendaring rules, or your own custom rules templates-then sync the deadline with your calender and share key dates acrosss your firm. Custom forms and Westlaw Doc & Form builder allow you to save, customize, and automate the assembly of forms and documents used in your law practice.